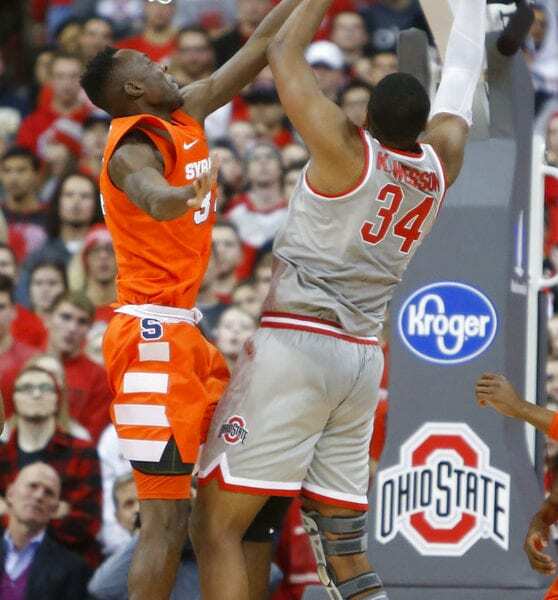 COLUMBUS, Ohio (AP) — Tyus Battle scored 20 points and Elijah Hughes added 18 to help Syracuse upset No. 16 Ohio State 72-62 in the Big Ten/ACC Challenge on Wednesday night for the Orange’s second straight victory. Syracuse improved to 4-2 on the season by shooting 49 percent from the field and 46 percent from 3-point land. C.J. Jackson had 19 points for Ohio State, and Kaleb Wesson contributed 13, as the Buckeyes (6-1) lost for the first time this season. Buckeyes look to get back to their winning ways when they open Big Ten play Sunday at home vs. Minnesota. Be the first to comment on "Syracuse Stops No. 16 Ohio State 72-62"